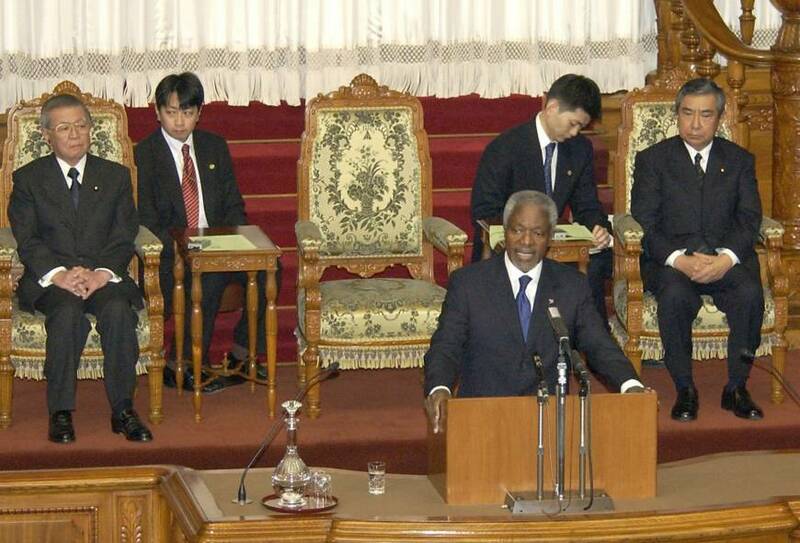 U.N. Secretary-General Kofi Annan addresses the Upper House on Feb. 24, 2004, during a visit to Japan. OSAKA – Former United Nations Secretary-General Kofi Annan, who died earlier this month, was remembered by former Japanese diplomats and U.N. experts as a strong supporter of Security Council reform plans that could have given Japan a permanent seat. The Ghanaian-born Annan, who served as secretary-general between 1997 and 2006, also gave encouragement to Japan’s regional diplomatic efforts in Africa and to human security efforts in other parts of the world. “Mr. Annan was very supportive to the idea of reforming the Security Council, which had been one of the top priorities of Japanese foreign policy. Japan has been, and is still trying, to realize reform together with other countries, particularly Germany, India, and Brazil, the Group of Four nations,” said Takahiro Shinyo, a former U.N. ambassador who is now Dean of Kwansei Gakuin University’s Integrated Center for U.N. and Foreign Affairs Studies. In 2005, as the U.N. celebrated its 60th anniversary, Annan published a report suggesting two models of reform. The first model would have provided for six new permanent seats with no veto powers, and three new two-year, nonpermanent seats to be divided up among the major regional areas. The second model was no new permanent seats but the creation of a new category of eight four-year, renewable seats and one new two-year, nonpermanent (and nonrenewable) seat that would be divided among the major regional areas. Due to opposition from the permanent UNSC members, particularly China, as well as skepticism among other countries that the new plans would benefit them, the deal was never approved. “As a rule, a reform plan must be presented by the member countries and not directly to the secretary-general, because the reform of the U.N. is a matter for the member countries. But Mr. Annan dared to suggest this concrete reform plan. This was not usual for a secretary-general, and I saw in this his bravery and strong personal commitment to strengthen the U.N.,” Shinyo said. Akio Nomura, a U.N. expert who is the former director of the U.N. Information Center in Tokyo and a member of the board of Global Compact Network Japan, said Annan did his utmost to reform the U.N., but also knew his limits as secretary-general. “But he did not hide his support of the (reform) efforts by the G4. I’m sure his support encouraged Japan’s effort,” Nomura said. Annan also encouraged Japan to do more with Africa. The Tokyo International Conference on African Development has been held every five years since 1993, and during Annan’s tenure, there were two TICAD leaders’ meetings and one ministerial conference, all in Tokyo. But the secretary-general also supported Japan’s efforts to promote human security in other parts of the world. “When I was Annan’s Special Representative of the Secretary-General in Timor-Leste from 2004 to 2006, he revealed his open-mindedness and his belief that impartiality was critical in making national leaders responsible for the fate of their people,” said Sukehiro Hasegawa, who is currently president of the Global Peacebuilding Association of Japan and remains involved with U.N.-related exchanges. “As the newly born country was about to descend into civil war in 2006, Kofi Annan was open-minded and listened to me. He then encouraged me to mediate impartially the disputes between the two leaders, President Xanana Gusmao and Prime Minister Mari Alkatiri,” Hasegawa added.